So, here I stand procrastinating on packing while Coach Rapper and His Lordship crafting away on a Easter gift for Gramma and Grampa and #3 strapped to my back. 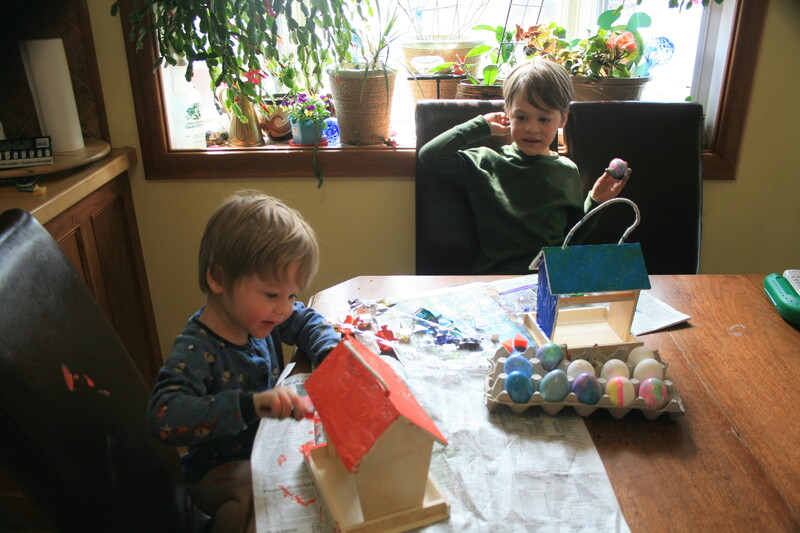 The Easter Bunny always brings a birdfeeder for the kids and this year we are turning it around and Easter Bunnying my parents with feeders the kids have painted. We are leaving earlier than planned because my parents stairs are being torn out on Monday. I got a good deal for a hotel on Monday night about 1/3 of the way home, and in the process of booking one ( http://www.priceline.com/ ) for Tuesday. I’ll have 2 500-600km days and 1 300ishkm day alone with the 3 wild boys. Should be fun. We have a hot dog roast planned with good friends for lunch on Monday 2 hours into the drive. So there is that. We have a small black hose with potable water running constantly in the yard. I have no idea where our new woodstove is- if Mr.T has picked it up, or if it is still in Castlegar. I have no idea if our new big! propane generator is going yet. I have no idea if there has been a pump purchased, or if a plumber has been found. I actually have no idea what the new steps up to the Yurt look like. And he has no idea we will be there on Wednesday. Last we spoke I told him Friday. Hey darlin’- if you read this before I get home, we will be there on Wednesday now and uhh, can you please make sure the composting toilet is shovelled out before we get there?